Chilies, genus Capsicum. Colourful, often flavourful and as many varieties as some candy. 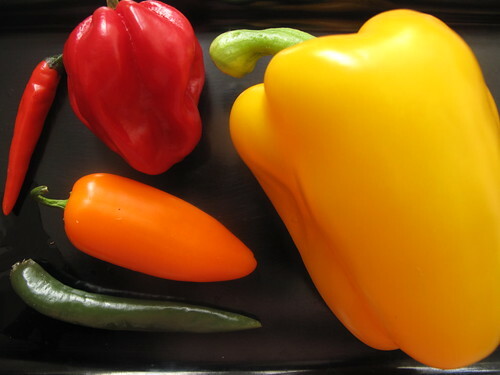 Actually peppers are a whole family – from your regular Paprika (Bell peppers) used as vegetables (salads et al) to your hot peppers used as a spices – think on the heat of curries and the spice of Tabasco and the like. Love them or hate them, you probably should know how to handle them peppers, you never know when they’ll cross your path or you theirs. Do the colours mean anything? 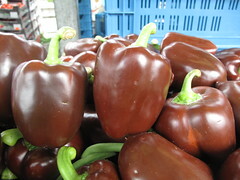 Well green peppers are unripe and the reds are ripe. 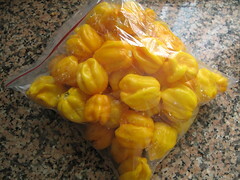 As for yellow, I would guestimate they were over-ripe considering that they are superbly sweet or hot. Take Paprikas for instance, the green ones are not so sweet, the red ones are sweeter and generally the yellow/orange are as sweet as the red or even sweeter. 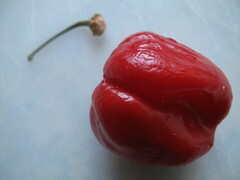 The same is generally true for the hot peppers – though we swap the sweetness for heat. 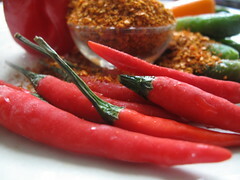 Green chilies tend to have a dull heat – not fiery, burning like the reds and yellows. 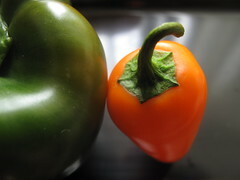 Some people think size matters – that the tiny chilies are hotter than the fatter ones…. 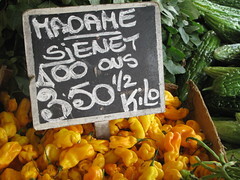 and that may hold true, say if you’re comparing long green and red chilies but when you compare the slim small Bird’s eyes reds with the larger Yellow Madam Jeanettes then that theory is blasted to bits. 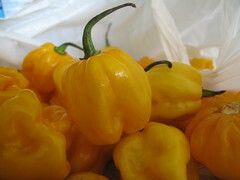 The yellow peppers are intensely hot, more so than the Bird’s eyes. Lesson #1, Chilies are hot. Green chilies may be very hot and so may the red, yellow and others be. If in doubt, don’t touch. Personally, I love chili. I eat loads of food without chili and enjoy them too. Chili is part of my history, part of my culture, like bread is to the dutch and pasta to the italian. I know people who like it a lot more than I do but lover that I am, I think a little goes a long way and enhances the flavours of the food. In fact the first name I came up with for my blog was ‘A li’l bit of chili’ but a few days later, I found someone else had something similar so I ditched it. The thing that give chilies or hot peppers their fiery signature is a chemical called Capsaicin which is concentrated in the veins and seeds of the peppers and less so in the skin…. So if you ever want to use peppers in a dish and don’t want the intensity of the fire, then do away with the veins and seeds. 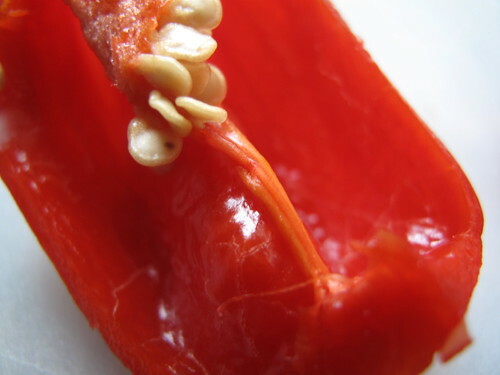 For this reason, you never want your hands, not to talk of other body parts to touch the inside of a chili pepper, except you have hands of steel. 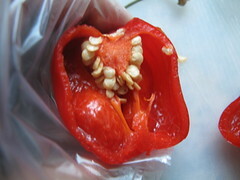 When Capsaicin gets on the hands and that happens very easily, water will not assuage the heat or cool it down…. Lesson #2: Wear gloves (real or make-shift), avoid contact with eyes and body parts and wash hands thoroughly after. In Nigeria, a lot of people rub talcum powder on their palms before wearing their gloves or hand ‘bags’ ….. it must offer some sort of protection. Because this chemical Capsaicin does not dissolve in water, washing your hands or drinking water will do no good. Milk on the other hand (and dairy products like yoghurt, buttermilk, cream et al) will work some magic albeit delayed – try rubbing on some some cold body cream or drinking some creamy dairy. Ring a bell – Indians and their lassi? Even tea seems to work. I have tried it (after watching my husband eat some hot meals with tea by his side, though that’s no test, he always has a cuppa with most meals). Like I said, I have tried it and it works. So some say milk and others say Ice-cream and even peanut butter. 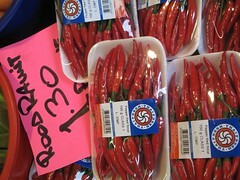 I buy my chili peppers by the pound. Then I destalk them (hands somewhat protected mind you), wash them and pack them in a ziploc and off to the deep freezer. This way – I rarely run out. 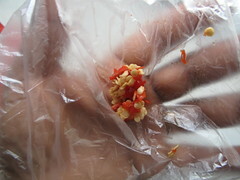 This also has another benefit because frozen chilies are easier to handle – they burn too if you don’t take precautions but the Capsaicin appears to be dulled by the icy temperatures. I can literally crush a frozen chili for use. 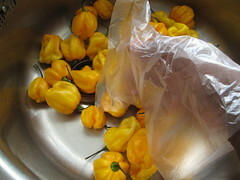 To prepare a chili, first put some gloves on or in the absence of those, ‘wear’ some light sandwich bags. Wash the chili and then take off the stalk. 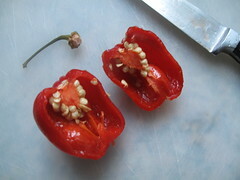 With a sharp knife, halve the chili lengthways so you have 2 ‘mirrors’. 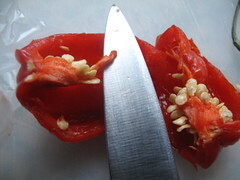 Then run a knife under the vein/rib in the centre of the halved chili and remove that along with the seeds. Throw the seeds away if you don’t want to use them….. Some people find it easier to handle by running under a tap. Then slice, chop, puree or do as recipe requires. Don’t forget to throw away the gloves and wash your hand thoroughly when you’re done. When you’re done, throw away the gloves and wash your hands thoroughly and dry. 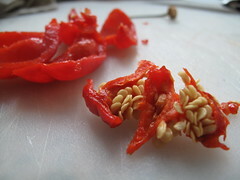 When I cook with chilies, rather than puree the pepper and add in, I often halve a chili and pop into a cooking dish and then I take it out after a few minutes and check the taste. If I’m satisfied, I don’t put the chili back in. If I still think it needs some more, than back it goes and I repeat the leave in, haul out and taste till I am happy. Lesson #3: Chilies in cooking pots tend to get hotter as the cooking progresses. You’ll need to watch this one! Leaving the food to cool down because hot food tends to taste more peppery – understandably – imagine the combined heat from cooking (temperature) and from the chili.